By David Fraser, Professor of Law, University of Nottingham, published by the University of Toronto Press. Section 93 of the Constitution Act 1867 guaranteed certain educational rights to Catholics and Protestants in Quebec, but not to anybody else. This study of the challenges, legal and otherwise, encountered by Jewish parents in educating their children in Montreal in the shadow of s. 93, will undoubtedly become the standard work on the subject. 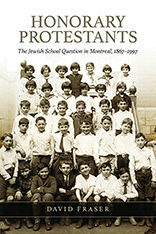 Faced with alternating periods of hostility and tolerance, the Jewish community of Montreal carved out an educational modus vivendi based on complex and continuing negotiations with the Protestant and Catholic school boards, the provincial government, and individual municipalities. Divisions within the Jewish community itself, with different groups alternating between cooperation and militancy, only added to this complexity. In the face of the constitution’s exclusionary language, all parties engaged in modes of informal normative ordering that were at times frankly unconstitutional, but unavoidable if Jewish children were to have access to public schools. Bargaining in the shadow of the law, the parties made their own constitution long before the constitutional amendment of 1997 finally put an end to the Jewish school question.